I don't know about you, but it is just about too hot to be outside working in the yard. Between the heat, the humidity and the mosquitoes, my enthusiasm is gone. For those of you that are diehard gardeners, I am providing a potpourri of landscaping items. The Lubber grasshoppers that emerged from the ground in March are now full grown, about 2 ½ inches long and eating everything in sight. They prefer plants in the lily family, but will eat other plants as well. These adults are mating and laying eggs for the next generation that will hatch next spring. Removing and killing any that you see will help reduce the number next year along with the accompanying damage. Lubbers are not easy to kill once they become large. The insecticides that will kill them would need to be applied directly to each insect. Killing them by squishing them with a brick or the heel of your shoe is an option. Or, pick them off and drop them into a bucket of soapy water works well tool. Bird-of-paradise (Strelitzia reginae) is a tropical flowering plant that can actually survive temperatures down to about 24 degrees F. However, freezing temperatures will damage developing flower buds and flowers. This plant derives its common name from the unique flower it bears, which resembles a brightly colored bird in flight. The showy bloom is actually a combination of blue petals and orange sepals that emerge from a beak-like bract (modified leaf). Blooms appear intermittently most of the year. Healthy, mature plants can produce as many as three dozen flower spikes a year, which will last up to two weeks when cut. The leathery leaves are held upright on stiff leafstalks and are about 6 inches wide and 18 inches long. The plant forms a 3- to 5-foot-tall and wide clump that can be used as a focal point in the landscape or in mass plantings. The evergreen leaves of bird-of-paradise do not drop from the plant, which makes it an excellent addition around pools or wherever shedding leaves are an aesthetic and/or maintenance problem. Planting now while we have rain helps the plant establish well. I think that everyone likes hummingbirds. Hummingbirds need high-energy food to support their high-energy activity and flying. They will use the nectar they feed on quickly, so one hummingbird may visit hundreds of flowers each day for feeding. To attract and keep hummingbirds in your yard, you must supply a variety of flowering nectar plants. The best nectar plants have red, orange, or pink flowers. Through trial and error, hummingbirds develop a preference for these colors since most nectar plants often have blossoms that color. Nesting hummingbirds need nectar from March through September, so choose plants that blossom during that time. Some good choices are Coral Honeysuckle (Lonicera sempervirens), Firebush (Hamelia patens), Glossy Abelia (Abelia grandiflora), and Scarlet Sage (Salvia coccinea). For more information, see the University of Florida/IFAS publication: Hummingbirds of Florida (http://edis.ifas.ufl.edu/uw059). If you need questions answered about plants, garden insects, or plant diseases, the Pinellas County Extension Master Gardeners hold a plant clinic at the Palm Harbor Library each Wednesday from 10 a.m. to 2 p.m. These volunteers are knowledgeable and eager to help you solve your plant problems. When bringing plant specimens for identification; please bring a branch with several leaves and flowers if present. Bring this wrapped in paper towels or in a paper bag. It would be best if you collect the specimen right before you come to the plant clinic. Last fall I decided that I would like to remove the St. Augustine grass in my front yard and plant drought-tolerant plants in its place. The first step in this process was to prepare a design and submit it to my Homeowner’s Association for approval. Once that approval was secured, the process could begin. First the existing grass was sprayed with Roundup to kill it completely along with any weeds that were lurking in the grass. It took about two weeks to achieve a full kill of the grass. I did not dig or till up the dead grass. By leaving it intact and planting directly into the dead grass, less soil was disturbed and fewer weed seeds were exposed to the sun (weed seeds generally need light to sprout). Next I picked out the plants at area nurseries. A number of the plants are Florida natives. I found all of the natives on my list at Wilcox Nursery in Largo, FL. The other plants were purchased at Palm Harbor Nursery in Palm Harbor, FL. Native plants used included Dwarf Yaupon Holly (Ilex vomitoria ‘Schillings’), Beautyberry (Callicarpa Americana), Coontie (Zamia floridana), Gulf Muhly grass (Muhlenbergia capillaris), Alligator lily (Hymenocallis palmeri), Sweet Acacia (Acacia farnesiana), and Sunshine mimosa (Mimosa strigillosa). Additional plants in the landscape include Liriope (Liriope muscari ‘Emerald Goddess’), Variegated flax lily (Dianella tasmanica), Bulbine (Bulbine frutescens), Aztec grass (Liriope muscari 'Aztec'), Society garlic (Tulbaghia violacea), Mondo grass (Ophiopogon japonicus), and Caladiums (Caladium x hortulanum). I ordered the Caladium tubers from a Florida grower (http://www.caladiumsonline.com/) in January for planting in early April. Planting took one hard day of work in late October. Then, all of the planted areas were mulched with shredded Eucalyptus mulch along with pine needle mulch around the edges next to the driveway and sidewalk. The plantings were watered every day for a month due to the seasonally dry October and November weather. On Thursday, March 4, 2010 I posted a blog entry about growing blueberries in containers (http://www.pamperedgardeners.com/2010.03.01_arch.html ). Near that same time I planted four 'Sunshine Blue' dwarf Southern highbush blueberry plants in large pots. They grew nicely and were covered with fruit this spring. I harvested about 2 cups of ripe fruit per day during the last two weeks in May. One of my plants withered during a quick three day period and was obviously dying. A second plant had only one stem that was similarly wilted. Lack of water was not the issue. All of the leaves on the first plant turned brown, but did not fall off the plant. The wilted stem of the second plant suffered the same plight. In addition, the older (last years) leaves on all four of my bushes had what looked like a leaf spot fungal disease that was not affecting the new leaf growth. Some concentrated research revealed that the first two plants were suffering from Blueberry Stem Blight. Highbush blueberries (my variety) appear to be more susceptible to stem blight fungus than are Rabbiteye blueberries. 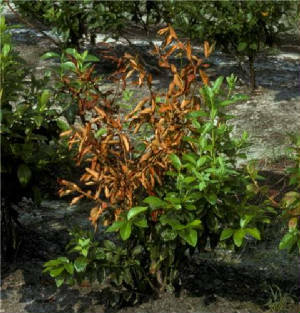 According to a North Carolina State University Extension publication, the stem blight fungus causes a rapid wilt with browning or reddening of leaves on individual branches, often followed by death of the entire plant as the fungus spreads downward through the base of the plant. Most infections can be traced to a wound as the initial point of infection. 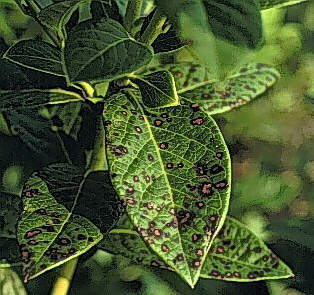 The most obvious symptom is called 'flagging'; stems recently killed by the fungus do not drop their leaves, resulting in a brown-leafed 'flag' which stands out against the green healthy portions of the bush. Pruning to remove infected stems is the best method of reducing this disease in established plants since there are no fungicides labeled for treating this disease. 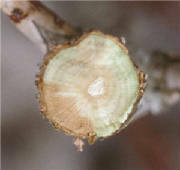 Pruning out infected stems could prevent the eventual death of the entire plant, and it will reduce the amount of fungus spores that are released that could infect other blueberry plants. Pruning can be done anytime that you see evidence of an infected stem. Be sure to cut well below the infected area. After the stem is pruned, you can examine the end of the stem that remains on the plant. If you see any brown areas in this cross-section, you must prune further down the stem until you no longer see brown in the cross section. I pruned my plant with the infected stem and so far the rest of the plant seems to be healthy. I moved it well away from the other two healthy plants just in case. Place pruned infected stems and dead plants in a plastic bag and dispose of in the trash. Do not compost this diseased material. Cultural methods seem to be the best way to control this disease, since fungicides do not provide adequate protection. Fertilizer should not be used, especially on young plants, after mid- to late-summer to allow the blueberries to enter their natural dormancy. You do not want to encourage the growth of new succulent stems late in the season. You will also want to avoid pruning of 1 - 2 year-old plants for this same reason. Succulent new growth is more susceptible to wounding. Pruning in these young plants should be limited to removing any diseased stems. I also learned that heavy fruiting on young plants can predispose then to stem blight. My plant that died was loaded with fruit. If I had removed some of the blooms from this young plant and it might have saved it from this untimely death. The leaf spot disease that affects the old leaves of all of my plants is apparently Septoria Leaf Spot. It is prevalent on many cultivated highbush and rabbiteye blueberry cultivars. According to the Florida Department of Agriculture and Consumer Services, this disease does not appear to cause a reduction in the amount of berries produced in Florida. Fungicide treatment is not necessary, but the fallen leaves should be collected and not allowed to remain underneath the plants.